This year, doctors will diagnose more than 221,200 new cases of lung cancer—115,610 in men and 105,590 in women, according to the American Cancer Society. An estimated 158,040 people (86,380 in men and 71,660 women) will die from the disease this year. Lung cancer is the leading cause of cancer death far exceeding that of the colon, breast, and prostate combined. More men and women are expected to be diagnosed with lung cancer thanks to the final decision earlier this year by the Centers for Medicare and Medicaid Services (CMS) to cover lung cancer screening with low-dose CT for current or former heavy smokers ages 55 to 77, which joins coverage from the Affordable Care Act. Lung cancer survival depends largely on the stage of the cancer when it is diagnosed. New screening coverage is expected to result in diagnosing more early stage lung cancer, which is more likely to be treated successfully and with surgery. While CMS had agreed to more screening scans, in 2013, it said that it would fund only three posttherapy follow-up FDG PET/CT scans per patient and per tumor type, including lung cancer. Any additional follow-up PET/CT scans will be funded only at the discretion of a local Medicare administrator, CMS has said. "In other words, if you want to do more than three, you will have to justify it," says Rathan Subramaniam, MD, PhD, MPH, an associate professor of radiology and radiological science, oncology, head, and neck surgery, and health policy and management at Johns Hopkins Medicine Division of Nuclear Medicine in Baltimore. Subramaniam and colleagues recently published a study in the Journal of Nuclear Medicine, "18F-FDG PET/CT & Lung Cancer: Value of Fourth and Subsequent Posttherapy Follow-Up Scans for Patient Management." In it, they found that fourth and subsequent follow-up FDG PET/CT studies do add value to clinical assessment and treatment planning strategy to lung cancer patients with advanced disease. "Our study supports the idea that follow-up scans performed for each patient should be planned based on the individual patient clinical context and cannot and should not be generalized for the whole subset of lung cancer patients," Subramaniam says. Ella Kazerooni, MD, MS, a professor, associate chair for clinical affairs, and division director of cardiothoracic radiology at the University of Michigan and chair of the ACR's Committee on Lung Cancer Screening, agrees with the study's finding even though it is a small, retrospective study. "To set a number is not a good way to look at what's appropriate for an individual patient," she says. When lung cancer patients have regional or metastatic disease, or they develop new clinical signs or symptoms of disease recurrence, PET/CT is needed to both to determine the extent of disease, and to monitor the impact of treatment. "We need to see whether that treatment needs to be altered to the advantage of the patient," Kazerooni says. Setting a limit on the number of PET/CTs the treating physicians can order is unfair to patients in this era of personalized medicine, she says. Amy Copeland, MPH, director of medical outreach for Lung Cancer Alliance, points out that the Journal of Nuclear Medicine study is small and involved only one center. It would have been better had it been a prospective study rather than a retrospective study, she says. Still, Copeland, like Subramaniam and Kazerooni, feels strongly that with lung cancer, diagnostic information is needed to best guide clinical decisions and should be made on a case-by-case basis. "With the CMS requirement that there be no more than three PET/CT scans covered after the first line of treatment, that's looking at it in a depersonalized way that may be harmful to patients on an individualized basis," Copeland says. Kazerooni says her concern with allowing local Medicare administrators to determine coverage for subsequent PET/CTs is that not everyone will have the same access to this important service. "As a local coverage decision, patients who have the same cancer may be able to get the fourth PET/CT scan in one region of the country and not in another," she says. "It would seem what's good for patients on the East Coast should be the same as what's good for patients on the West Coast." The current ruling allows for the possibility of varying coverage decisions, she says. Lauren Shaham, deputy director of the media relations group at CMS, says all local Medicare contractors are instructed to "make reasonable and necessary determinations based on evidence similar to our National Coverage Determinations." The researchers reviewed a total of 285 fourth and subsequent follow-up PET/CT. All the follow-up scans were performed within about 13 years of the original scans. The number of follow-up scans per patient ranged from 4 to 28 scans. Sixty-one (71.8%) patients had 4 to 6 follow up scans. Seventeen patients (20%) had 7 to 10 follow-up scans; 9 patients (10.6%) had more than 10 follow-up scans. A total of 112 scans were performed as the seventh follow-up scan or later. Of the 285 follow-up scans, 54 (48.2%) scans were performed for routine follow-up; 24 (21.4%) scans were done for posttreatment assessment of either chemotherapy, radiation therapy, surgical resection, or radiofrequency ablation instituted for disease recurrence; 7 (6.3%) scans were performed as part of midchemotherapy response assessment; 14 (12.5%) scans were performed as follow-up of previously PET-positive findings; 9 (8%) scans were performed as follow-up of previously PET-indeterminate findings; 2 (1.8%) scans were performed for evaluation of a paraneoplastic syndrome; and 2 (1.8%) scans were performed for evaluation of clinically identified disease recurrence. The researchers found that of the 285 fourth and subsequent follow-up PET/CT scans, 149 (52.28%) were interpreted as positive and 136 (47.7%) were interpreted as negative for recurrence or metastasis. The follow-up PET/CT identified recurrence or metastasis in 44.3% of scans performed without clinicians suspecting either. Recurrence or metastasis was ruled out in 24.2% of scans performed with prior clinical suspicion. The follow-up PET/CT scan resulted in a change in 28.1% (80 out of 285) of patients. New treatment was initiated in 20.4% (58 out of 285) of scan times. Treatment course was changed in 5.6% (16 out of 285) of scan times, and ongoing treatment was stopped in 2.1% (6 out of 285) of patients. "We showed very clearly that in a certain percentage of patients, the follow-up fourth and subsequent scans were really valuable," Subramaniam says. In some cases, the follow-up scans confirmed recurrence despite lack of symptoms, and, in others, the scans found no recurrence despite indications that the tumor may have returned. "Our results show that the fourth and subsequent scan has a role to play in clinical judgment and the ability to order scans as needed is much more valuable than a blanket statement that limits the number of scans," Subramaniam says. Kazerooni agrees that the study, while small and retrospective, has proven the value of PET/CT scans for patients with advanced lung cancer. The extra scans proved their worth when they found that some patients who appeared to have recurrence did not and that some patients who had no obvious signs of recurrence did, she says. "It's important that we be able to perform the additional scans if we're trying to impact the outcome for those patients," she says. An FDG PET/CT scan costs about $1,400, according to Subramaniam. Compare that amount to the thousands of dollars for radiation or chemotherapy the patients are given and it makes no sense not to perform an additional scan if it can help make treatment decisions and eliminate costly treatments that are not necessary, Subramaniam says. Subramaniam says the CMS decision that three follow-up PET/CT scans per patient and tumor type should be enough prompted his investigation. CMS made its decision with "no science behind it," he says. "It was an educated guess." Initially, CMS was not going to fund any follow-up scans, but after receiving feedback from a number of different groups, it made a final decision to allow up to three. Subramaniam says the three-scan limit applies to any tumor type, not just lung, and he and his investigators are researching whether additional scans have value in other cancers, including colorectal and breast cancers. The manuscript for follow-up PET/CT scans for colorectal cancer is in review and its research on breast cancer follow-up PET/CT scans is just under way, Subramaniam says. "We will look at other common cancers to see if we see a similar pattern in [them] as well." 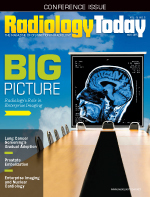 Subramaniam notes that the number of patients who required more than three scans was less than 10% in their study. "It's not a huge population compared to the entire percentage of people who have that particular cancer," Subramaniam says. So it seems CMS is making an arbitrary rule that isn't cost-effective. Kazerooni says it's important to study the value of follow-up PET/CT scans for the different cancers because not all cancers behave in the same way or have the same virulence. The radiologists don't anticipate this study will have an impact on the larger number of people who will be diagnosed with lung cancer as the result of increased screening. The goal of the screening is to find lung cancer in its earliest stages when it is most treatable. The patients who need additional PET/CT scans are those with advanced lung cancer. "If you treat early, the chance of survival is better, and the chance of recurrence is going to be less," Subramaniam says. "Our study is more about picking up recurrences and managing them properly and about adding confidence to clinical judgment." Copeland says there still is a reasonable rate of recurrence even for people whose cancers are caught early, so there will be a need for some ongoing monitoring. Copeland doesn't anticipate the Journal of Nuclear Medicine study to be practice changing because it is so small. However, she says, "it is an important contribution to what we already sort of feel like we know: that patients should be looked at as individuals and not as a group. There needs to be flexibility in clinical decision making and, if physicians feel it's important to their treatment decisions to order the scan, they should be able to do so, and not be hampered by lack of coverage."